Fight back against blemishes with Clarity. Retinol and salicylic acid work together to help exfoliate the skin and clarify clogged pores that can cause breakouts and blemishes. Willowherb, tea tree oil and aloe vera help soothe and calm the appearance of agitated skin. Use as part of your regimen for acne-prone skin or as a spot treatment for clearer-looking skin. AGP Complex – a microencapsulated retinol for oily, congested and acne-prone skin – encourages skin renewal to reduce the appearance of wrinkles and imperfections. Apply a small amount to cleansed and toned skin in the morning and/or evening. Follow with recommended moisturizer and daily sunscreen. Apply a small amount to cleansed and toned skin in the morning and/or evening. Follow with recommended moisturizer. Can be applied as a spot treatment to reduce existing acne or over areas with excessive oil production such as the T-Zone. 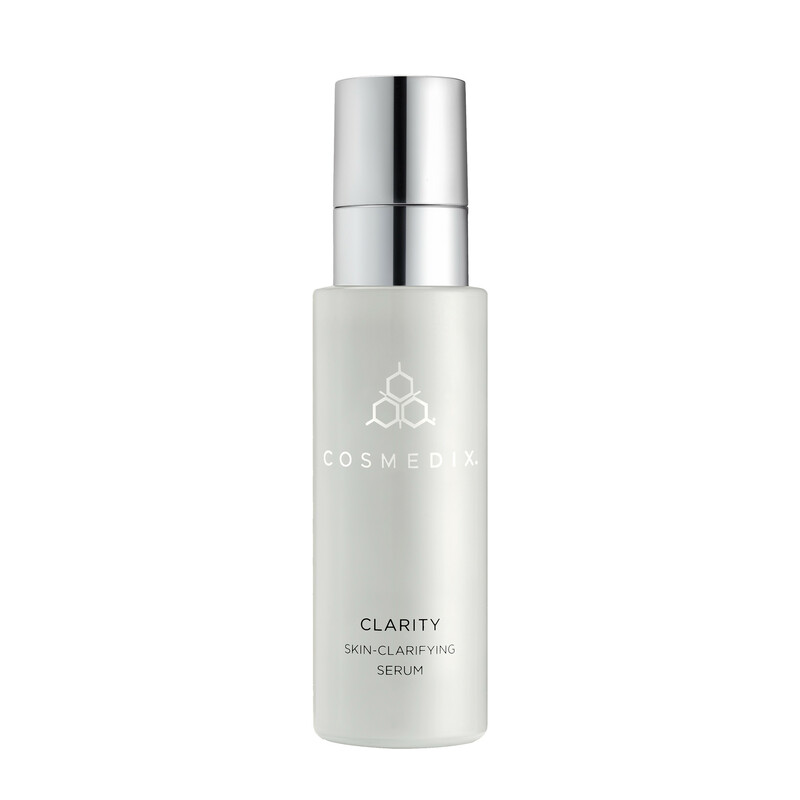 I absolutely love Cosmedix Clarity Skin Clarifying Serum. I did not start getting acne until I was an adult, so I have struggled to find a serum that battles aging and also keeps my skin clear and that is why I love this serum. Most serums I have tried clog my pores and end up causing more breakouts. I highly recommend this fabulous skincare product! I like how it feels. I have sensitive skin and it works for me. I’m loving this serum, I have noticed a significant improvement in the tone and texture of my skin. Very happy with this. I love it! My skin feels so much better, I’ve tried other products before but nothing like this - I highly recommend it. I really love this serum! It leaves my face feeling hydrated and soft! I really enjoyed using this product. I didn't see results right away but within a month of using this, my face was more clear and firm. I haven't been using this long at all, maybe about a week, and already I notice some changes in my skin tone. I have bad discoloration and this is helping out a great deal. I love this product so far and will definitely be buying more in the near future. I loved the Clarity Skin Clarifying Serum! My skin felt fresh and smooth. I love a brand that is committed to clean products. It's a great product. A friend recommended it and it's truly amazing! My lifesaver and cleared my skin efficiently! I was soo surprised how fast my skin cleared up by using this product. I usually break out very easily and have really large pores. I highly recommend this product for people that haved acne prone skin and need a solution asap! This is it! This has worked wonders for both my adult acne AND my teenage daughters’ acne. I HIGHLY recommend. I used to be so embarrassed by my uneven skin tone patches but this cleared them right up. It made them brighter and less noticeable! This stuff is gold! I loveeeee this product, it has changed my skin for the best!!! I love that it helps my skin feel so smooth and hydrated! I’ve tried so many clearing treatments and this one is hands down the best! Anytime I feel a blemish coming I apply this a spot treatment and the area is clear within a day or two! Keep the breakouts at bay! I LOVE this product! I mix pure c and clarity and layer it under my hydrate plus. My skin stays clear all summer long! i love it! very cute packaging. i love the way it makes my face feel so healthy. I was really taken back from the odor from this product. I tried it second, after the purity clean face wash which has a beautiful light citrus scent. I hope that this product actually does something because it takes alot for me to put it on my face with the way it smells. This product is amazing. It absorbs into the skin quickly and I did notice my skin became much clearer. I was getting fewer breakouts. Now I use it every other day to keep it at bay. Feels so good!! My face feels and looks really good!! This product works so well! I was impressed that it didn't dry out my skin and worked so effectively. Tried a sample I received and followed up with the emulsion hydration creme I have since instructions state to follow up with moisturizer and its the one I am currently using. I noted sensation and positive effects just after applying while allowing to absorb in the skin a bit. Definitely the cruelty free is an added feature. I'm seeing more of this brand in my skin care cabinet. I was a little skeptical trying this, but it does really help with breakouts. I was reading into the ingredients, and it has retinol and salicylic acid, which makes this a powerful combo for fighting acne and anti aging. The serum is lightweight (more like an oil rather than a cream), but it does have a very strong chemical scent - watch out if you are sensitive to smells. Other than that, I could notice my skin was better in 3 days. Clarity is unlike any skincare I've used before. It does what it boasts and more. This is definitely a product you need on your vanity. I've spent hundreds and hundreds of dollars looking for a clarifying serum of this caliber. Never before has my skin been this clear, this bright, this gorgeous! This was a very rich and creamy serum. It worked great with my skin and really brightened the spots. It made my skin shine and feel so soft, and I love the smell. Definitely worth money and its just one of the best ive ever tried. I really enjoyed this product! It worked very well for my skin! I would definitely recommend it to anyone! I liked that I only needed a little bit to cleanse and tone the skin. It feels so soft and blends well in the skin. Loved this serum! It hydrated and refreshed my skin and reduced pores and redness. It made my skin glow and super smooth! This has definitely helped my skin! A little goes a long way and I love the way it has helped my skin look and feel much smoother and clearer. This is lightweight, very hydrating and doesn’t leave a sticky feeling on your skin. Amazing product! This product is magnificent, it’s so soothing feels magical! Love using this skin care product. My face looks and feels great! Its easy to apply and makes my skin new and healthy looking. Being in the desert I thought this would dry my skin out even more, but it doesnt. Clears up problem areas fast! I use everyday with no problems & get lots of compliments. I have tried many products on the market and have found that Clarity has been the best for my very oily skin. It keeps my skin clear of acne and pimples. My skin gets oily in about 9 hours. This product really help me to clear up some blemishes that I have had for a long time. I got this product as a sample along with my order of resurface treatment. I didn't have a chance to try it until two days ago when I ran out of regular face products. After I spread it on my skin, I immediately felt the burn. Later that day, my skin started peeling off and I got red bumps on both my checks and chin. More red bumps showed up on my forehead the next day and I had never felt this dry on my face. I have been so embarrassed going out. If you have sensitive skin, don't use this product!!! 1yr of use & I LOVE IT! Excellent product that actually works. This is my go-to daily product to get rid of pimples and acne overnight, without drying or causing any skin irritabilities. This product has never failed me. I absolutely LOVE, LOVE, LOVE this product. I love this product! I have struggled with acne for 14 years. I was able to see results within the first week. I can't wait to try other products in this line. My boyfriend owns a medical spa, so he hoards skin care products and forgets to use them. About a week ago, I decided to give the Purity Clean Exfoliating Cleanser a try, and I was amazed on how soft my skin was after just one wash. I didn't use this sirum but after I noticed that he didn't use it on his skin care routine, I decided to keep it for myself. Thankfully I don't have an acne problem other than the occacinal period pimple. I do however, get a lot of white heads and had small, but still noticeable, craters on my cheeks due to acne from when I was a teenager. After using the Purity Clean Exfoliating Cleanser and this sirum for a week, my face looks better than it has in years!!! My craters are a lot less noticeable and my white heads are almost gone! I only apply the serum at night as well as the face wash. In the mornings I wash my face with Purity Face Wash by Philosophy since is very mild and it doesn't contain any medication. I then apply Philosophy SPF 50, which also contains anti-aging properties. I can't wait to see where this procuct takes my skin. I've never been happier! It doesn't burn my skin or makes it peel but yet it works better than any product I've tried from store bought to even the ones prescribed by my dermatologist. I LOVE IT!! My boyfriend owns a medical spa, so he hoards skin care products and forgets to use them. About a week ago, I decided to give the Purity Clean Exfoliating Cleanser a try, and I was amazed on how soft my skin was after just one wash. I didn't use this serum but after I noticed that he didn't use it on his skin care routine, I decided to keep it for myself. Thankfully I don't have an acne problem other than the occasional period pimple. I do however, get a lot of white heads and had small, but still noticeable, craters on my cheeks due to acne from when I was a teenager. After using the Purity Clean Exfoliating Cleanser and this serum for a week, my face looks better than it has in years!!! My craters are a lot less noticeable and my white heads are almost gone! I only apply the serum at night as well as the face wash. In the mornings I wash my face with Purity Face Wash by Philosophy since is very mild and it doesn't contain any medication. I then apply Philosophy SPF 50, which also contains anti-aging properties. I can't wait to see where this product takes my skin. I've never been happier! It doesn't burn my skin or makes it peel but yet it works better than any product I've tried from store bought to even the ones prescribed by my dermatologist. I LOVE IT!! Staple to my skin regimen! I love clarity serum! As someone who has always dealt with oily/acne prone skin, this product is definitely a must for my morning and nightly routine. It keeps my skin clear, helps control the oiliness AND it absorbs right into my skin so I can wear it under my make up no problem. Even with using it twice a day everyday, it lasts me about 3 months which makes it a pretty reasonable and well worth it investment.